In John 19:30 one finds arguably the most important word that Jesus ever uttered. In the last minutes of his tortuous six hours hanging on the cross, shortly before He committed His spirit to the Father, He cried out through parched, cracked and bleeding lips the word, “Tetelestai.” While in the Greek it is one word, it took three English words to express its meaning, “It is finished.” O, what an utterance by the Christ of the Cross! First, JOHN used the word when writing about Christ as the fulfillment of the Old Testament Messianic prophecies. John 19:28 records that in Christ all things were “accomplished” regarding His fulfillment of the Scriptures. The word John uses is “tetelestai”…..all has been completed, has been fulfilled, and has been accomplished. Of the over 300 prophecies surrounding the promised Messiah, Christ fulfilled every one of the them to the letter. Scripture’s fulfillment is finished, it has all been accomplished and completed in Jesus Christ. After His resurrection, Jesus explained to the two travelers on the road to Emmaus that He was the complete and perfect fulfillment of all the Messianic prophecies found in the Law, prophets, and the psalms (Luke 24:36-45). We need not look for another Savior…He has come, all is complete and finished in Jesus. Second, SERVANTS used the word when having obediently completed a task for their master. With the job being faithfully finished the servant would proclaim, “tetelestai”…it is finished. As Jesus uttered “It is finished” He was proclaiming that he had obediently completed the task of obeying the Law of God perfectly which the Father had sent Him to do. As the faithful Servant of God, as the Representative of humanity, Christ lived the perfect life the holiness of God demands, providing for us His perfect righteousness that enables us stand before the Lord uncondemned. “For there is now no condemnation to them that are in Christ Jesus” (Romans 8:1). Third, PRIESTS used the word when examining before offering an animal sacrifice for someone, and upon finding the lamb acceptable would say, “Tetelestai.” When Jesus cried, “It is finished” He was proclaiming as our High Priest that His Sacrifice was acceptable to the Holy Father. God’s Holiness demands justice against sin’s violation of defying His holy standards. But not only did Christ, as our High Priest, offer the Sacrifice, He was the Sacrifice. “He was the Lamb of God who came to take away the sin of the world” (John 1:29). Offering Himself as the sacrificial Lamb, He who knew no sin became sin for us that we might become the righteousness of God in Him (II Corinthians 5:21). Christ’s resurrection is God’s “Amen” that His Sacrifice was acceptable and the need to offer anymore sacrifices for sins is forever finished! Fourth, MERCHANTS used the word when a note or bill was paid, writing “tetelestai” across the note/bill signifying that it had been paid in full. Because of Christ’s perfect life and substitutionary death, the sin debt we could never pay was PAID IN FULL. Christ paid a debt He didn’t owe to pay a debt we could never pay. “For ye know the grace of our Lord Jesus Christ, that, though he was rich, yet for your sakes he became poor, that ye through his poverty might be rich” (II Corinthians 8:9). Sixth, ARTISTS used the word when they made the last brushstroke on a painting, exclaiming, “Tetelestai” ….it is finished, it is done, it is complete. All of the Old Treatment promised pictures of the Messiah were fulfilled in Christ. Some examples: In Genesis, the Messiah is painted as the Seed of the Woman, in Jesus the portrait is finished. In Exodus, the Messiah is painted as the Passover Lamb, in Jesus the portrait is finished. In Leviticus, the Messiah is painted as our High Priest, in Jesus the portrait is finished. In Deuteronomy, the Messiah is painted as the Great Prophet, in Jesus the portrait is finished. In Isaiah, the Messiah is painted as the Suffering Servant, the Heir to David’s throne and the One born of a virgin, in Jesus the portrait is finished. In Malachi, the Messiah is painted as the Son of Righteousness, in Jesus the portrait is finished. In every painting of Christ found in the 66 OT books, in Jesus every portrait is finished, completed, and hung as a Masterpiece. Seventh, MATHEMATICANS used the word when after completing a complicated math problem, exclaimed, “Tetelistai”…..it is finished, it is done, it is complete. The spiritual math of humanity is incorrect in its thinking, believing that we can “add” to our ledger enough good works that will add up to us obtaining salvation by our own efforts. The Bible is clear that by the works of the Law no one can be saved (Romans 3:20; Galatians 2:16). No one can ever do enough good works that will add up to self-justifying salvation. Salvation, plus nothing and minus nothing, is found only in the Christ of the Cross. Our works “add-up” to nothing, but Christ’s Sacrifice on the cross is sufficient to save all who knell before Him in acceptance of his finished work. Eighth, CONQUERING WARRIORS used the word when victorious in battle, “tetelistai”…..it is finished, the victory is complete and victory has been accomplished. 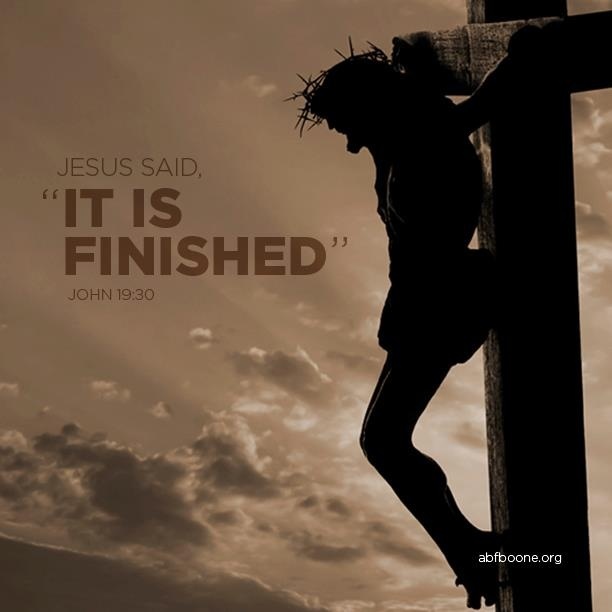 When Christ cried out, “It is finished” it was not a word of one who was defeated, but of a Conquering Savior who was victorious over sin, satan, death and the grave. As Jesus hung on the cross, the world said, “Aha” but three days later arising from the dead the world said, “Huh?” Our Champion accepted the challenge to do battle for our soul’s redemption against every evil foe… and He was victorious! He was victorious, and all those who place their trust in Him share in His victory. Halleluiah! It is finished! What a grand utterance. We bow in awe before such majestic words. Thankfully, the redemptive work of Christ has been fully, finally and forever been accomplished.